Captain Christian L’Orange, an early plantation owner, was commissioned by King Kalakaua to bring the Norwegians to the islands. But there was discontent and controversy from the very start when they found that the labor contracts they signed in Norway, written in Norwegian, were fundamentally different from the contracts presented on arrival, written in English. Many felt they had been misled and staged one of the first labor strikes in the islands. As soon as their contracts expired the majority of Norwegians left for the U.S. mainland. A small number of Norwegians remained in Hawaii working as skilled tradesmen, craftsmen or merchants. 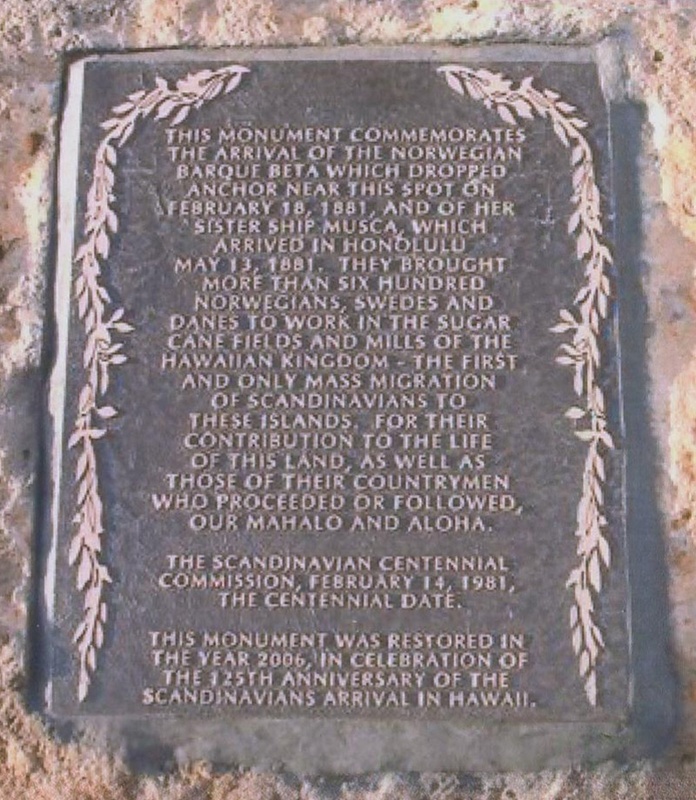 Although the emigration to Hawaii was a failure, the Norwegians who stayed left a lasting legacy. Today there are many Hawaiians who are immensely proud of their part Norwegian ancestry and feel it an honor to trace their heritage to the ‘Beta’. I believe my fiance’s great great grandparents were aboard the Bark Beta. They were married in March of 1881 and gave birth to their first two children on Honolulu. But beyond the passenger list , I am able to find little about their time there…. nothing, in fact. Any suggestions as to who i could reach out to. I’ve tried several historical organizations with little help or luck. 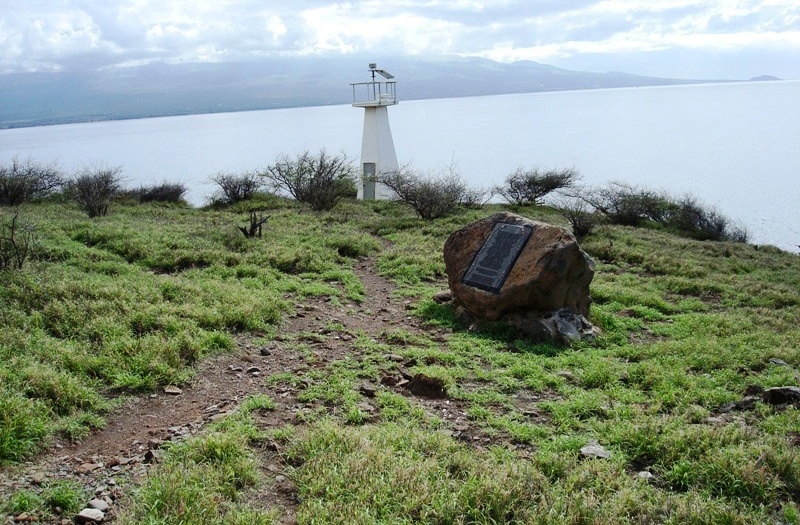 We recently visited the lighthouse site on route 30. The plaque shown on the rock has been removed, either by vandals or someone trying to preserve it. Would like to know what happened. It is sad to say that the Monument was vandalized about 2 years ago and the plaques were removed and stolen. We are in the process of trying to repair the monument by replacing the plaque with something of less value to steal. It has taken some time to raise the funds to cover the costs of the artwork and materials but hope to have this project completed soon. 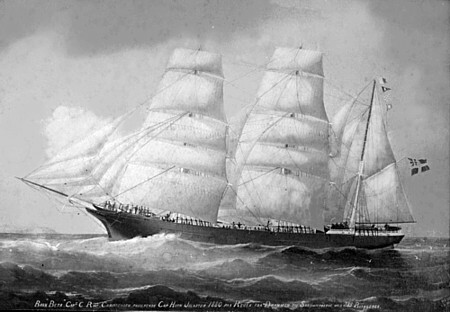 Are there passenger lists of the Norwegian and Danish immigrants on the ships? Yes there is a website called “Norway-Heritage” that has a list and some additional details on the Emigrants that came on the Beta.